Located just 15 miles northwest of Atlanta, Marietta serves as the county seat in the center of Cobb County, Georgia. 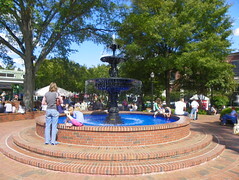 Marietta is home to museums, theaters and art exhibits, shopping, parks and unique restaurants, and many of these attractions are located in historic Marietta Square. Mr Junk is happy and proud to serve all the areas of Marietta, including historic Marietta Square, near the Big Chicken, and the areas of East Cobb. Whether it’s a refrigerator you need to move, or you’re looking for a company to offer fantastic customer service during an extensive attic or basement clean-out, Mr Junk wants to be your junk hauling expert in Marietta, Georgia! At Mr Junk, we place extreme care for the environment by recycling or donating everything we can at our pick-up sites, with only the true junk going to state-approved landfill sites or transfer stations. Recyclingnot only reduces waste, but it’s good for our environment and our economy. Every Mr Junk customer gets the extra care and treatment we feel they deserve. When you hire us for your junk removal needs, you’ll see the difference! Let Mr. Junk be your go-to for junk removal services in Marietta, GA. And don’t forget to ask us about our discounts for repeat customers and our referral program!